• 10-bill package introduced to increase handouts for illegal aliens living in bankrupt, drought-stricken state. Earlier in April, California state Democratic leaders introduced a series of legislative bills designed to grant protection and provide benefits for the estimated 2.5 million illegal immigrants residing in the state. Arguing that immigration reform has stalled at the federal level, California state Democratic legislators hope to provide the sort of leadership and vision they believe is required to solve the nation’s immigration crisis. “With these bills California will again show the kind of practical, humane and forward-thinking leadership that we hope can move the needle on the national discussion,” Assembly Speaker Toni G. Atkins (D-San Diego) explained at a press conference announcing the legislative package in Sacramento, the state capital. Hispanic legislators were out in front in support of the bill, but behind the scenes the usual suspects were pulling the strings. “I also want to recognize senator Block, the chair of the Jewish Caucus,” de León said at the press conference (40 seconds). Martin Jeffrey “Marty” Block, who has a long history of support for gay rights issues, is a retired professor who founded the San Diego Latino/Jewish Coalition and served as president of the San Diego Chapter of the American Jewish Committee. The legislative package would extend healthcare coverage, legal rights, business protections and other benefits to illegal aliens residing in California. SB 10—Establishes the California Office of New Americans to ensure that California has a comprehensive approach to immigrant integration. SB 4—Extends access to healthcare coverage through Medi-Cal to all Californians, regardless of immigration status. AB 622—Strengthens the state labor code to protect immigrant workers from unscrupulous employers. SB 600—Amends the Unruh Civil Rights Act to make it unlawful for businesses to discriminate against a person on the basis of immigration status, citizenship or language. AB 60—Protects Californians from immigration attorneys and consultants demanding advance payment for services related to a pending immigration reform act, such as President Barack Obama’s executive actions. SB 674—Ensures all immigrant victims of crime in California have the opportunity to apply for the federal Victim of Crime Visa, or U visa. AB 899—Protects immigrant children by safeguarding their records from unauthorized disclosure to federal immigration officials that may result in a child’s deportation. AB 1343—Avoids unintended detention and deportation by requiring defense counsel to provide accurate and affirmative advice and defense against such consequences. AB 900—Aligns California law with federal immigration law to allow for the maximum number of youth in California to receive humanitarian relief. AB 1352—Ends unintended immigration consequences for immigrants who successfully complete deferred entry of judgment programs, which are alternatives to court proceedings that allow offenders to participate in drug rehabilitation treatments. Many Republican lawmakers in California are skeptical of the legislative package, questioning the costs associated with the various bills. Others argue that the legislative proposals essentially reward illegal aliens and encourage further illegal immigration, incentivizing the invasion of America largely by unskilled, unassimilable aliens from Mexico and Central America. Joe Guzzardi, the national media director for Californians for Population Stabilization, argues that these legislative proposals, if passed, only encourage even more illegal immigration. The bottom line is that “if these measures pass, it will increase the attractiveness of coming to the U.S. illegally,” added MacDonald. 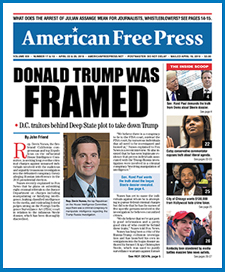 AMERICAN FREE PRESS also spoke with long-time California resident and international corporate lawyer William D. Johnson, the chairman of the American Freedom Party. Careful Donald, watch your back? The wealthy donors, their special interests and certain dark entities, don’t like to be cut off from their money supply? YOU CANNOT BE BOUGHT, SO THEY HAVE TO FIND ANOTHER WAY? They are dumbfounded, as here is a man who tells the truth about the Trade Agreement, illegal immigration, our economy, the Middle Eastern peril who under Obama’s rule are not terrorists. They cannot bribe Donald, so they are using the left wing media and George Soros and the rest of the Communists. Somebody at last as Trump who is not afraid to pass on the truth, so he gets my families vote and I will walk the streets to ‘stump’ for him. America is ready to hear the truth and Donald Trump as just the man to enlighten us. Will Trump win the presidency? The jury is still out and both sides of the political spectrum are out to do him harm with their verbal retaliation for informing us of the real truth. Not the manipulation of records that doesn’t offer us the real population numbers of illegal aliens; misleading us about the growing cost between $60-100 billion annually. Not the parasites disguised as the poor illegal aliens, downplayed by government and media and not informing the daily dangers of the illegal alien invasion; the hit and runs, drunk behind a wheel of a vehicle, the female assaults, and the rapists; little children molested and the murderers and dangerous individual that scour our streets for prey. Donald Trump is the sugar in the gas tank or a spoiler of the Transamerica Corporation on the other side of the abhorrent U.S. border. Millions of Americans will never hear the truth about the odious southwestern border, because the information is hidden from the unsuspected public. Trump is a breath of fresh air. He will wake the voters up, especially about the terrible consequences of illegal immigration. On the website of ‘The Dark Side of Illegal Immigration’ the truth prevails; telling the American people the truth, not the prevailing lies from the Democrats and the establishment hierarchy of the GOP. The ‘status quo’ is not there for the American people. A great many of the politicians are there to add extra weight to campaign contributions. Crony capitalism has an old adage of ‘you scratch my back and I’ll scratch yours.’ Inside the big house called Congress, there is bribery and corruption on a grand scale. That’s why both sides of the aisle are running scared and already lying about the polls that Mr. Trump is a few points behind Jeb Bush in New Hampshire, the top man in the GOP, but not the tea party. Even Senator Ted Cruz is not fooled by the old boys’ money club in the GOP, which he calls the CARTEL. He is another true American who speaks his mind. Another is Senator Jeff Sessions of Alabama who also from the beginning spoke up about the dangers of the FAST TRACK TRADE TREATIES. In the last great trade trickery 700,000 Americans lost their jobs with the inception of NAFTA (The North American Free Trade Agreement) and all the promises of abundance for the consumers was a downright lie. Everything from Mexico is imported without any tariffs as it is from China and other unfriendly countries who hate our individualism and freedoms. It’s a shame we have a hopeless, demented man for a president who has lost the American people’s trust, except for the socialist radicals who exist. They have tried to cut out a niche in our Republic, by using the ‘Political Correct Policing’ who are more like the KGB who were secret police in the Soviet Union controlling the people with their spies. I am a 26-year veteran of the Merchant Marine and Mr. Trump has my vote, because he echoes the truth relating to the Mexican government and their attitude that they cam dump their poor into our country and that we should pay for all their wants, including healthcare, cheap housing and a cornucopia of benefits, not easily accessed by American citizens. Univision TV can cry all they want, but you cannot hide the facts about the illegal alien incursion. I for one want my taxes going to veteran’s health programs for the permanently maimed and not depending on charities, our senior citizens, and the poverty in America. Let Mexico, Latin America and South America and every other nation care for their own people. CHAIN MIGRATION, which is amplifying our population of foreigners through birthright citizenship law, bring their offspring here and demand we give them welfare. • 147,000 in local jails. • The American people must assume that numbers are even higher today, but without informing the people 195,000 illegal alien felons have been released by the Obama Homeland Security back into our gullible society. • The article also notes that approximately 27% of all prisoners in federal custody are criminal illegal aliens and the majority (63%) of those are Mexican citizens. Donald Trump has it correct when he says that he will build a great wall between Mexico and the United States. The article goes on to state that in fiscal 2004, the federal government spent $1.4 billion to incarcerate criminal aliens. Are you in search of the unrestrained truth and not the rhetoric or propaganda from the GOP establishment or the Democrats? Then click on Judicial Watch, an unbiased non-profit foundation that blatantly tells you the facts about corruption in federal, state and local government. In many instances this administration and Congress ‘believe they are above the law,’ but Judicial Watch carefully examines the law and will take them to court to be held accountable. The One America News Network, a 24/7 cable broadcast, offers world wide news, and not the prejudiced, misleading partisan news that has leanings of either Democrats, liberal or even the establishment Republicans. As a businessman I’m not against amnesty and I welcome illegal people to work for me and to live here. California is the idiot that just won’t stop dancing. I wonder how much water California would have today if it weren’t for the 51 MILLION immigrants that have come into the country in the last eight years? Since Obama’s primary foreign policy strategy is capitulation, can we just GIVE them California and call it a day? They have sold out California, what a joke these people are, the are NOT solving any problems, unless they are trying to give California to the illegal criminals! Didn’t anyone in the Hispanic media read Obama’s book? By any measure, fears of (Illegal) immigration are driving many white Americans to the Republican Party. And, indeed, the Republican strategy on immigration appears to have been successful. Republicans now control the House and the Senate, the governor’s office in 31 states, and two-thirds of the state legislatures. They are winning the political war. An even bigger factor is that the ties of racial and ethnic minorities to the Democratic Party are tenuous. Research by Taeku Lee and myself shows that most Latinos and Asian Americans don’t feel like they fit into either party. In national surveys, those who refuse to answer a question about party identification, those who claim that they do not think in partisan terms, and independents make up the clear majority of both groups. All told, 56% of Latinos and 57% of Asian-American identify as nonpartisans. Even among blacks, there are signs of ambivalence. Almost 30% of blacks feel that the Democratic Party does not work hard for black interests. Gee, No wonder why I fall into the Proud Independent group. We are selling our homes and moving our businesses to another state. Shame because our families have been in California for generations. Illegal aliens have destroyed our neighborhoods in Marin making them unsafe. Illegal alien kids have infected our schools so our children are not getting the education they deserve. Everywhere I go there are more Mexicans than Americans. The quality of life in California has been seriously degraded compared to when we were children. Exact reason we moved away from California over 10 years ago, it is a lost, sh*tty place to live or visit anymore, thugs everywhere, crime on every corner, and way overpopulated now, just a crap hole. You the voters deserve what you get, and F you if you think you’re going to get a bail out when the entire state goes bankrupt.